Dales understand that to deliver the highest quality you have to start with the highest quality. That’s why Mark carefully chooses his produce from only the best local farmers. Pigs from Pump house, Lamb from Lupton, Beef from Bentham or Barnoldswick, wherever the standard is highest is where we go. 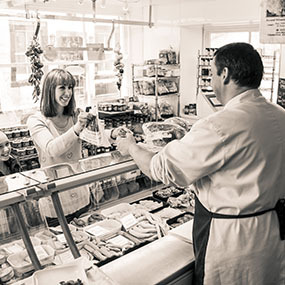 AND unlike many high street butchers and super markets we still prepare our meats in the traditional method hanging them for anything from 1 week to 3 weeks…in fact whatever it takes to guarantee the tenderest most succulent results.